This awesome little restaurant is probably my favourite find in Brixton Village. 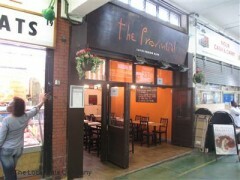 The owner is super smiley and friendly, and the food is brilliant and reasonably priced. The food is excellent, the owner allows BYOB, and the location is vibey. My favourite dish: the ribeye. It's a huge portion, juicy and delicious. And the empanadas are teh best I've ever had.